Want to know the leading source of weight gain in this country right now? If “we are what we eat,” and we’re eating way more than we’re supposed to; it makes sense that we’re also weighing much more than we’re supposed to. Our view of portion size is so unbelievably distorted due to the huge portions of today’s food industry that we don’t even know what a portion size should really look like anymore. With restaurants offering enormous plates of food, drink cups often in “Big Gulp” sizes and snacks sold in king-sized packages, it can be hard to know how much to eat sometimes. But the problem is at home too. The size of dinner plates, muffin tins, and serving dishes have grown. Cars have larger cup holders to accommodate the drink sizes stores sell. As everything gets bigger, bigger starts to seem like the norm, distorting how we think about a serving size or the “right” amount. One study found that modern portion sizes of popular foods added an extra 50 to 150 calories. While that might not sound like too much, an extra 100 calories per day can pack on an extra 10 pounds of weight in a year! As portion sizes have increased in size over the years, so have we. Hamburgers have expanded by 23 percent; A plate of Mexican food is 27 percent bigger; Soft drinks have increased in size by 52 percent; Snacks, whether they be potato chips, pretzels or crackers, are 60 percent larger. Not surprising, the prevalence of adult obesity in the United States has increased from 14.5 in 1971 to 30.9 percent in 1999. Some meals appearing “average” in size can add up to a whole day’s worth of calories. A large order of french fries can contain as many as 1,000 calories. Add a hamburger and an extra-large soda, and you’re getting more than 2,000 calories in one sitting. And this isn’t unusual. A study published in 2012 found that 96 percent of restaurant meals exceed USDA recommendations for fat, salt and overall calories. According to the National Institutes of Health, a “portion” is how much food you choose to eat at one time, whether in a restaurant, from a package or in your own kitchen. A “serving” size is a specific amount of food or drink, such as a cup of yogurt or a tbsp of peanut butter. Many foods that come as a single portion actually contain multiple servings. The Nutrition Facts label on packaged foods—on the backs of cans, sides of boxes, etc.— tells you the number of servings in the container. Sometimes the portion size and serving size are the same, but sometimes they are not. Over the past few years portions have grown significantly in restaurants, as has the frequency of Americans eating out. Take time to learn the difference between a portion size and a serving size. You may see that the portions most people consume are often more than what they need to eat to keep their bodies at a healthy weight. Of course, eating larger portion sizes at one sitting will not cause weight gain unless it contributes to a total eating pattern in which a person regularly consumes more calories than he or she expends in one day. Knowing the proper portion size for different types of food can help to control your intake of foods, regardless of where you are. Measuring your food is shown to decrease the amount consumed in one sitting and also helps stick to proper serving sizes. The best place to read labels is in the grocery store, before you even buy a specific food. When you get home, follow the serving size on the package and divide that item into separate packages for you to grab and go in a hurry. Be aware of the serving sizes for particular foods and try to only consume that amount in order to avoid having to double (or triple) the amount of calories, carbohydrates, and fat consumed. They may give you much more food at a restaurant than what you would serve at home, but that doesn’t mean you have to finish the entire plate. 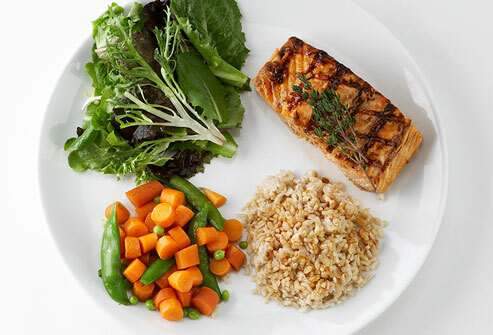 Try to take half of the meal home to eat the following day, or split a meal with someone to half the calories. Not only are food journals are top tool for weight loss, but also for portion control. Writing down what you’re eating will encourage you to eat healthier, eat less, and be mindful of your eating habits. If you are craving a certain food, it can be okay to indulge from time to time, but make sure you are having a small portion and recording that cheat in your food journal! Not only will it be physically impossible for you to put more on the plate, but also using smaller plates gives the illusion of eating more food. So in terms of portions, size definitely does matter.